Auroras flare up when energetic particles plunge into a planet’s atmosphere, bombarding gases and making them glow. While electrons generally cause this natural phenomenon, sometime protons can elicit the same response, although it’s more rare. 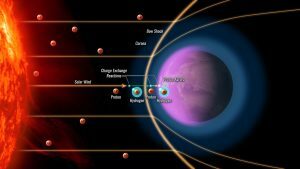 Now, the MAVEN team has learned that protons were doing at Mars the same thing as electrons usually do at Earth—create aurora. This is especially true when the Sun ejects a particularly strong pulse of protons, which are hydrogen atoms stripped of their lone electrons by intense heat. The Sun ejects protons at speeds up to 2 million miles per hour (more than 3 million kilometers per hour) in an erratic flow called the solar wind. The LASP-led MAVEN (Mars Atmosphere and Volatile Evolution mission) team was studying Mars’ atmosphere with the Imaging UltraViolet Spectrograph (IUVS), and observed that on occasion, the ultraviolet light coming from hydrogen gas in Mars’ upper atmosphere would mysteriously brighten for a few hours. They then noticed that the brightening events occurred when another MAVEN instrument, the Solar Wind Ion Analyzer (SWIA), measured enhanced solar wind protons. But two puzzles make this type of aurora seem impossible at first glance: how did these protons get past the planet’s “bow shock,” a magnetic obstacle which normally diverts the solar wind’s charged particles around the planet? And how could the protons give off light, since atoms need electrons to do so? When those high-speed incoming atoms hit the atmosphere, some of their energy was emitted as ultraviolet light, which is invisible to the human eye but detectable to instruments like the IUVS on MAVEN. In fact, one incoming atom can collide with molecules in the atmosphere hundreds of times before it slows down, giving off a slew of ultraviolet photons. Proton auroras do occur at Earth, but not as often as at Mars. One key difference is Earth’s strong magnetic field, which diverts the solar wind away from Earth to a much greater degree than at Mars. 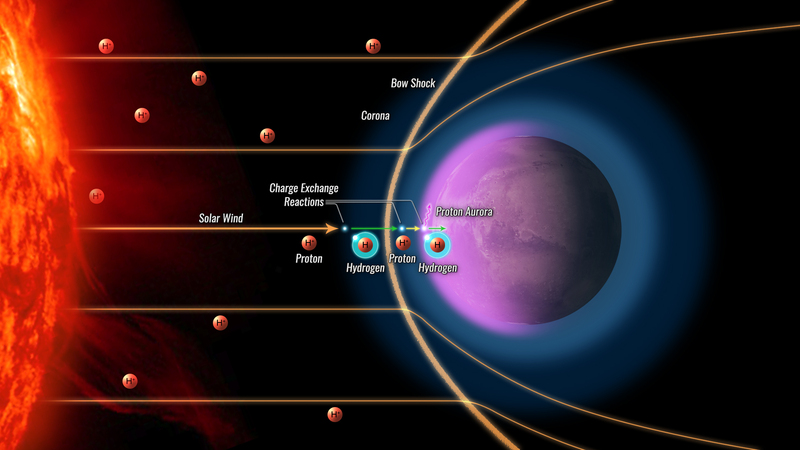 On Earth, proton auroras only occur in very small regions near the poles, whereas at Mars they can happen everywhere. However, proton auroras could be common on Venus and Titan. Like Mars, these two worlds lack their own magnetic fields, and have lots of hydrogen in their upper atmospheres—with plenty of electrons to share. Looking further, it’s likely that many planets orbiting other stars have the same favorable conditions, and would be likely to have proton auroras too. This research was funded by the MAVEN mission. Bruce Jakosky, LASP associate director and CU Boulder professor of geology, is the principal investigator of the MAVEN project, which is managed by NASA Goddard. LASP engineers designed and built the IUVS instrument. Read the original release from NASA. More graphics related to this research are also available.